Faux finishing is an interior painting technique used on surfaces to resemble other natural materials. It can be applied to a variety of surface materials such as dry wall, plaster, wall board, metal, wood, glass, and ceramic. Use faux finishing for enhancing the decorative look in your home and increasing its value. Continue reading for benefits that come from applying faux finishes to the interior of your household. - Great way to enhance and accent home structures such as doorways, ceilings, and columns. - Durable and requires little maintenance. Faux finishing is washable, and lasts longer than other decorative wall tactics such as wallpaper. Also unlike wallpaper, faux finishes do not have seams nor will these finishes peel. - Applying faux finishes to the walls in your home is an excellent way to hide any imperfections, like cracks, holes, and depressions. - Faux finishing has the ability to transform the dull and boring areas in your home and add depth, design, and dimension. 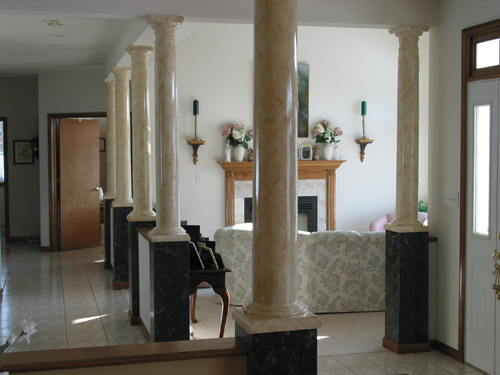 - Faux finishing is very cost effective and can be customized to any homeowner’s desire. Call 1-800-SOBRINSKI for faux finishing information for your Allentown remodeling, Bethlehem remodeling, or Easton remodeling project. Deciding to finally start your basement remodeling adventure will give you the opportunity to create that extra space in your home that doesn’t need to follow the same scheme as the rest of your house. Finishing your basement means a chance to get innovative with new colors, lighting, and design. However, before you start the design process you must first evaluate your basements climate to determine whether or not you will be limited as far as your material choices. For example, if your basements floor or walls are sensitive to moisture, carpet flooring might not be the best option for you. - Type a plastic sheet in different areas of your basement. Make sure the sheet is close to airtight. Leave the sheets of plastic there for at least 24 hours. If you live in a dry area you may want to leave the sheets sit for a longer period of time. When you check the sheets of plastic after a solid amount of time and you find water has collected than you will have to take extra steps before you install your new basement floor to ensure it is waterproof. These steps will involve contacting a professional to install a vapor guard. Tile – Tile is a fantastic choice for basement flooring. It has water resistant properties that are ideal for any basement sensitive to water moisture. Tiles come in a wide variety of styles, sizes and color. One of the biggest benefits of tile flooring is that it is easily replaceable and repairable. Hardwood – Hardwood flooring is sophisticated and looks as elegant in your basement as is does in the main floor of your home. Although not a great material for a basement susceptible to water seepage, for dry basements it is a beautiful touch. Carpet – Carpet is ideal for anyone looking to turn their basement into a relaxed or kid friendly atmosphere. It is homey, comfortable and a great way to keep in the warm and cool air during the different seasons.